Here you are, sitting in the driver's seat - just like Starsky! 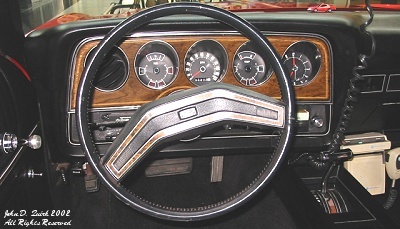 From left to right on the dash are 1) an air vent, 2) the gas gauge and some indicator lights, 3) the speedometer, 4) temp gauge, and 5) the optional clock which no longer works. You can't quite see it, but that's a David Soul 8-track in the player. Again, the woodgrain around the gauges is not stock, and has been replaced with a black piece since these photos were taken. The woodgrain on the steering wheel is stock, but not standard. This is the leather-wrapped sport steering wheel that this car came with, but that was an option that the original owner paid extra for.